1) There is no such thing as “sleeping in” for an 11-year old. 3) Watching TV is a lot harder when you have to monitor the shows for content not suitable for an 11-year old (besides, it’s not my place to discuss homosexuals with my 11-year old niece – we’ll leave that to her Dad). 4) The Disney channel has really corny movies. 5) Before she goes running off to the water at the beach is when we should have the talk about beach safety. 6) Bed time is REALLY early (which is why dinner at 6:00 p.m. instead of 8:00 p.m. is a good idea). 7) It’s much easier to be a cool uncle than a cool dad (I can’t take my own kids to Krispy Kreme for breakfast, but with my niece it’s okay). Having an 11-year old is nice when you need help bringing in the groceries or cooking dinner. 9) 11-year old’s are more astute than I realized (“Aunt Andrea’s going to take a nap when we get home from the beach, isn’t she” Why yes, she is). 10) Kids always remind you that you have ice cream in the freezer. At the Y I work at, we have water aerobics that is popular with our Senior members. Recently the instructor purchased new music because they were getting tired of the same old music. Who let the dogs out Woof, Woof, Woof, Woof-woof! Today is my birthday. It was a great day – one of those, “I get to do whatever I want because today is my birthday” days. I slept into 11:00 a.m.! I can’t remember the last time I did that. I then watched the San Francisco Giants claw their way to another victory. My wife then took me to see Halle Berry in Catwoman (MEOW!) and then we had a nice dinner at Johnny Carinos. After that we came home and watch Trading Spaces while many gifts were bestowed upon me. My wife, Andrea, gave me a jigsaw, a personal electric grooming kit, and Avril Levigne’s latest CD (all by request). My cat, Nutmeg, gave me a long snuggle on my chest while I watched Trading Spaces (completely on her own – you can’t ask a cat to do that). If only every day could be so good. So, I’m driving down the street along side another car when I casually look over at the driver. The driver is dressed in a big curly red wig, has a really white face with red lips and a big red nose. I’m assuming he wasn’t yet wearing his big floppy shoes. He cut my hair in silence after that. 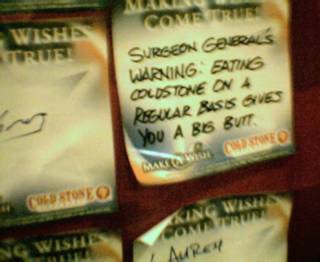 Seen at the Cold Stone Creamery in Mission Beach, San Diego. So, I’m driving to work this morning and I’m closely following a small pickup truck that is obviously involved in the construction industry. I’m listening to the morning radio show and thinking about my day ahead when the passenger in the truck catches my eye. I glance over to see him leaning his head out the window and before I could even guess what he was doing, I saw it. A reddish, chunky stream of vomit came spewing out of his mouth. I hit the brakes to avoid the splatter and thought that was the end of it – but it wasn’t. He vomited twice more within the next 30 – 60 seconds. Finally, we were separated as we got on the on-ramp to the freeway. Interesting that the driver of the truck never slowed or, it seemed, even turned his head toward his hurling friend. Perhaps I should sit down and actually read the manual. What did people do before cell phones I’ll tell you one thing that didn’t happen. Wives didn’t get upset at husbands because they didn’t call to tell them they were stuck in traffic.